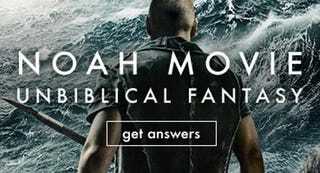 If you were a major online news/opinion website, would you get Ken Ham's opinion on a movie based on Jewish legend and mythology? Let's check his qualifications. Ken Ham is not a scholar of Jewish legend or mythology. Ken Ham is not a film scholar. But he is a guy who runs a fake museum that badly interprets Jewish legend and myth. So I guess he's qualified enough. I, as the editor of Time.com, will thus let him rant on my website. we have an obligation to send out a warning, and in so doing also to communicate biblical truths and undo the possible damage that might be caused by this sci-fi fantasy — one that is making a mockery of the Word of God and its true account of Noah, the Flood, and the Ark. There you have it, folks: Noah is sci-fi fantasy. That means that everyone at io9 should see it twice.